Sarah Winnemucca was an icon of human rights, an empowering figure in women’s history, and an advocate for education. Sarah was one of the most determined and compassionate people that ever lived. The idea of encompassing the essence of Sarah Winnemucca in one sculpture is no small order. The theme of Sarah’s belief in the “brotherhood of all mankind” was equally challenging. How can one express such a concept in a single figure? The basis of my design for the sculpture centered on these questions; as I read her autobiography and books written about her, my vision for bringing the spirit of Sarah to life began to take shape in clay. She was such a dynamic person that I knew I had to portray her in motion. Physical movement captures Sarah the activist, the woman with amazing zeal for her cause. As an abstract design scheme, a dynamic curve flows upwards from the fringe of her intricately detailed dress, rising and spiraling to the tip of the figure. It is an energetic gesture to the lift the eye higher and higher towards the focal points of the piece. These basic design choices (using a curving diagonal instead of a static perpendicular line) are the framework for the entire piece. Beyond the abstract scheme, the question remained of how best to represent her broad belief in the “brotherhood of all mankind.” As I visualized Sarah in motion, moving toward her goals of peace and brotherhood, the answer came to me like a whirlwind. What one icon has represented people from all walks of life and all ends of the earth coming together in brotherhood for freedom and equality? Frédéric-August Bartholdi’s “Liberty Enlightening the World,” better known as the Statue of Liberty. This monument has been a beacon of hope to the world’s oppressed and downtrodden. Unlike Lady Liberty, Sarah Winnemucca was a real person. She was the people’s hero, so it would not be appropriate to link her too closely to the classically idealized “Liberty.” For that reason, the link is subtle, almost subconscious. There is indeed a book in her left hand, and her right hand raised, she moves ahead, translating foundational ideals into literal strides. She brings to life the ideal. Her lived idealism guided me in every detail of the piece. In the art of many times and places, the wind is a symbol of change and spirituality. The strong wind that animates Sarah’s dress not only adds visual excitement to the twists and beads, but also provides a visual correlative to the changes brought about by her humanitarian work. This wind also represents the spirituality of the Paiute culture. Sarah’s grandfather and father were both shamans who saw visions of things to come. Sarah was a shaman in her own right: the visions she describes in her book came to pass, and her spirituality served her well in every part of her life. She says in her book, “Weep not for your dead; but sing and be joyful, for the soul is happy in the spirit land” (Winn. 43). Wind serves as an allusion to her spirituality and, more importantly, to the changing times in which she lived and to the positive impact she had on the world in its entirety. 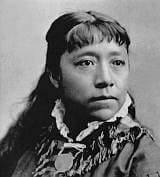 Sarah Winnemucca was the first Native American woman to write a book in English. The book in her left hand is not only a reference to this but also a symbol for education, knowledge, and morality. Sarah’s vehicle for presenting the plight of her people was education. She was able to speak, read, and write English. Education empowered her to be the bearer of her people’s burden. She realized the importance of education and started a school for Paiute children, the first of its kind. The book also serves as a reminder of the high morality of the Paiute people. She often compares and contrasts the values of her people with that of white society. She quips that the “savages” didn’t need to be taught to love their mother and father because they already did. “We are taught to love everybody,” she says, and “to be kind to both bad and good, for you don’t know your own heart” (Winn. 45 and 51). She contrasts the high character of her people’s dealings with white settlers by saying, “You call my people bloodseeking. My people did not seek to kill (white settlers), nor did they steal their horses—no, no, far from it. During the winter my people helped them. They gave such as they had to eat. They did not hold out their hands and say: ‘You can’t have anything to eat unless you pay me’” (Winn. 10). The book in her left hand works on many levels to convey her sense of morality and knowledge. Sarah’s name in Paiute—Thocmetony—means “shell-flower.” The flower in her right hand is a literal reference to her Paiute name and a strong reminder that Sarah held the highest esteem for her native culture, on which she speaks extensively in her book. She says outright, “I Sarah Winnemucca am a shell-flower” (Winn. 49). The flower is a symbol for peace and harmony with nature. As Sarah offers it up to the wind, she is offering herself up to her cause. Thocmetony is bringing about change; peace is her offering to the world. Her dress, although not everyday clothing for Sarah, was meant to help rally people to her cause. The twisted and knotted sinews on her dress were a token for safe passage through hostile territory. Sarah had to raise money for her trips to Washington D.C., and she charged admission for people to hear her speak. She felt her specially made, immensely detailed dress helped in recruiting an audience. The dress she is wearing is shown in most of the original photographs of Sarah. From an aesthetic standpoint, the intricate weavings, beads, knots, and twists create a wonderful array of visual textures. Although recreating the dress in clay (and later in wax and bronze) was extremely challenging, it would have been an aesthetic and historical compromise to portray her in any other garb. Capturing Sarah’s unique physical and facial features was absolutely essential to the authenticity of the piece. Her strong hands convey her sense of work ethic. Although she was a chieftain’s daughter, she was not afraid of hard work, and at times in her life she was forced into menial labor in order to survive. Sarah lived in a tumultuous time period. Her sturdy build and strong arms convey her fortitude in the face of seemingly impossible odds. After studying photos taken throughout Sarah’s life, I chose to represent a combination of her personal characteristics in her portrait, rather than simply sculpt a facsimile of her face from a single photograph. Her portrait conveys her culture, determination, vitality and youthful optimism, compassion, and composure. It is a portrait of her spirit. Her deep dark eyes tell the story of her life. She was determined to accomplish her cause, and although she died in tragedy, believing she never accomplished her purpose, she wears a very slight, enigmatic smile, suggesting what she foretold of her death: “I shall be in the sweet rest of peace, I the chieftain’s weary daughter” (Winn. 12).